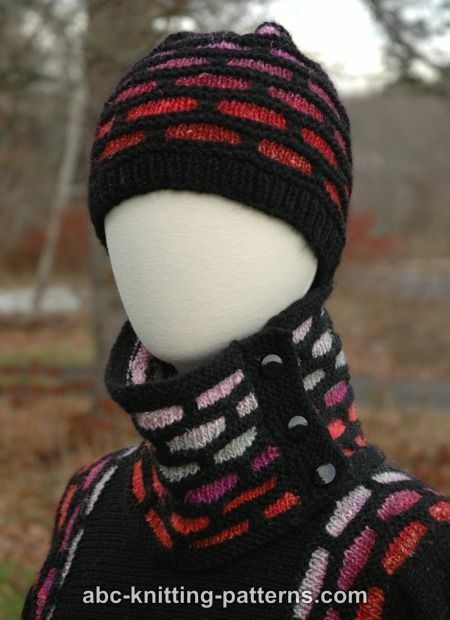 I think it's pretty obvious why I named this the Brick Road Hat :) I knitted this hat to match the Brick Road Seamless Sideways Sweater. It features the same 2-color Brick motif. 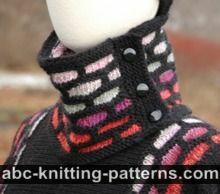 There is also a matching Brick Road Cowl. 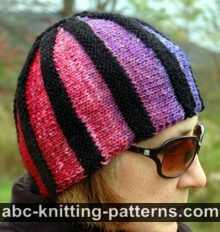 The hat is knit from the bottom up, in rounds, seamlessly. I like this method because it lets you get the circumference right from the very beginning. Height from edge of brim to top center of crown 8 1/2" (21 cm). All rounds: K1, p1 across. 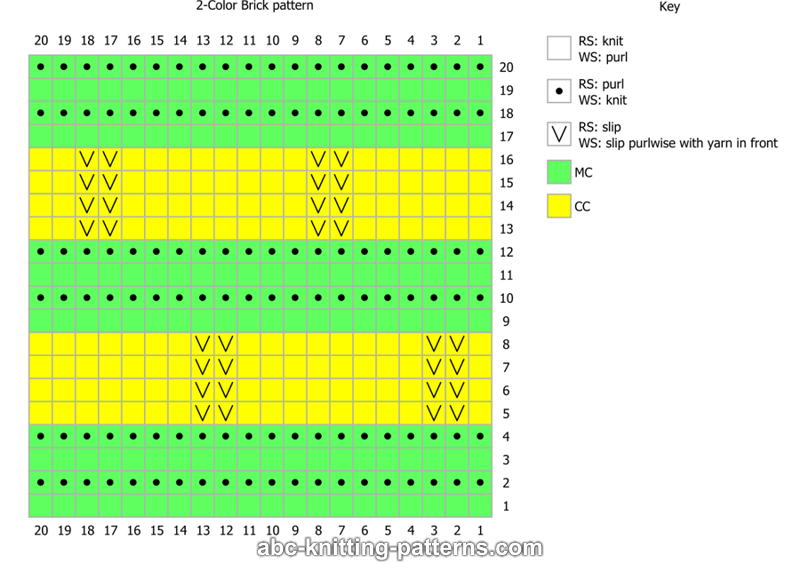 Rounds 1 and 3 (MC): knit. Rounds 2 and 4 (MC): purl. Rounds 5-8 (CC): k 1, *sl2 wyib, k8, repeat from * across to last 9 sts, sl2 wyib, k7. Rounds 10 and 12 (MC): purl. Rounds 13-16 (CC): k6, *sl2 wyib, k8, repeat from * across to last 4 sts, ending with sl2 wyib, k2. Rounds 18 and 20 (MC): purl. 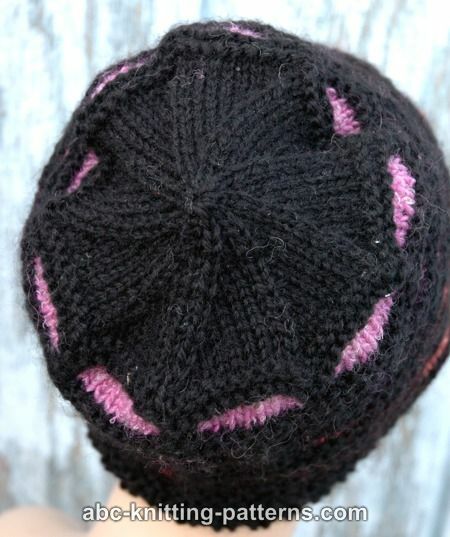 The hat is worked in-the-round, without seams, from the bottom up. 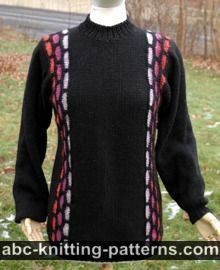 It begins with the rib, then the main part is worked in a 2-color pattern, finally the top is worked in stockinette st and shaped with decreases. Cast on 90 sts, join and continue to work in rounds, being careful not to twist. Place a marker at the beginning of the round, slip the marker while working. Work rounds 1-8 in 1x1 rib: *k1, p1 , repeat from * to the end of the round. Start the 2-Color Brick pattern. 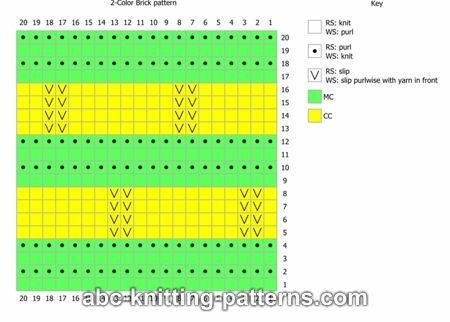 There will be 9 repeats of the pattern in the round. 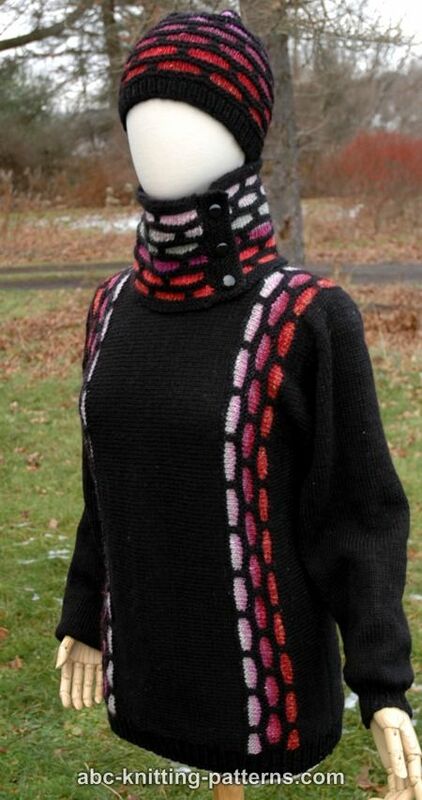 Round 9 (MC): knit 90. 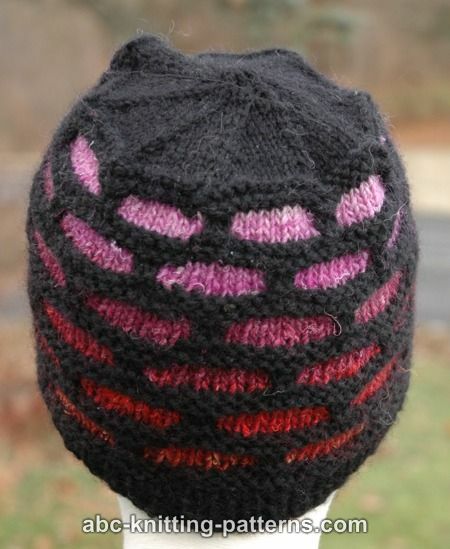 Round 10 (MC): purl 90. Rounds 11-12 (MC) – repeat rounds 9 and 10. Rounds 13-16 (CC): k 1, *sl2 wyib, k8, repeat from * 8 times to last 9 sts, sl2 wyib, k7. 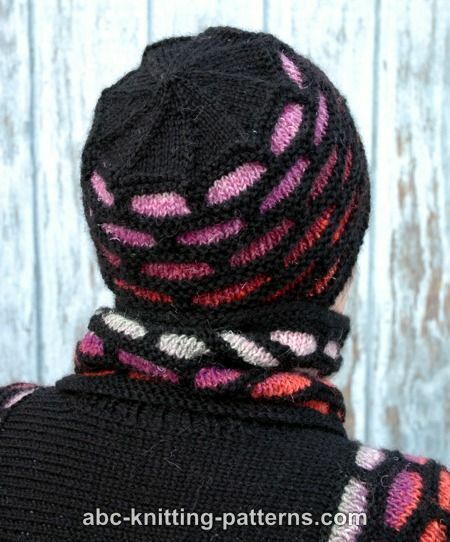 Rounds 17 and 19 (MC): knit 90. Rounds 18 and 20 (MC): purl 90. Rounds 21-24 (CC): k6, *sl2 wyib, k8, repeat from * across to last 4 sts, ending with sl2 wyib, k2. 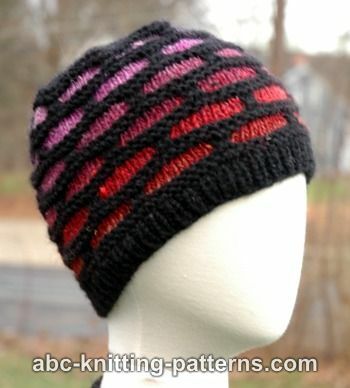 Rounds 25 and 27 (MC): knit 90. Rounds 26 and 28 (MC): purl 90. Repeat rounds 13-28 two more times. Top is worked in MC. Round 1 (decrease round): *k8, k2tog, repeat from * 8 more times. (=81 sts). Round 2 and all even rounds: knit. Round 3 (decrease round): *k7, k2tog, repeat from * repeat from * 8 more times. (=72 sts). Round 5 (decrease round): *k6, k2tog, repeat from * 8 more times. (= 63 sts). Round 9 (decrease round): *k4, k2tog, repeat from * 8 more times. (=45 sts). Round 11 (decrease round): *k3, k2tog, repeat from * 8 more times. (=36 sts). Round 13 (decrease round): *k2, k2tog, repeat from * 8 more times. (=28 sts). Round 15 (decrease round): *k1, k2tog, repeat from * 8 more times. (=18 sts). Cut yarn, leaving a 10" (25 cm) tail. Pull through all the remaining sts and secure.